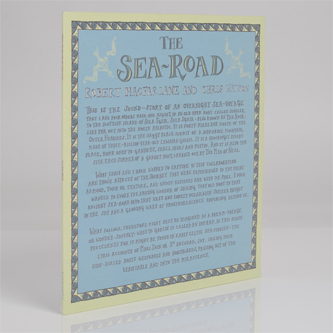 'The Sea-Road' is a unique and adventurous collaboration between author Robert Macfarlane and sound recordist Chris Watson blending field recordings with spoken word and archive audio. 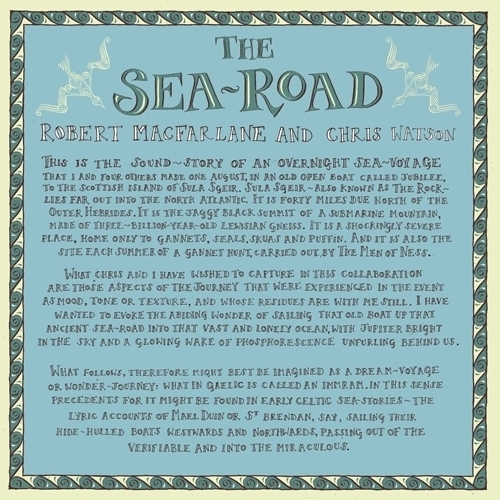 In the main piece, recorded live at Port Eliot festival, 21st July, 2012, Macfarlane regales the story of an overnight sea-voyage made in an old wooden boat from the Outer Hebrides to "the rock", a 3 billion year old mountain called Sula Sgeir, covered in gannets and jutting out of the North Atlantic. Chris Watson accompanies with a vivid soundscape of howling winds, distant caws and roiling waves, beautifully capturing the atmosphere of their journey, albeit from a more impressionistic, dreamlike perspective perhaps most suitably described as an Immram, an dream-voyage or wonder-journey in Gaelic. Furthermore, Watson offers two sound works in response to chapter's in his pal's books over on the B-side. Inspired by a chapter in Macfarlane's 'The Old Ways', 'Granite' was recorded on location in the Cairngorms and manifests a blustery trip across fast flowing waters to open expanses always overlooked by a chorus of wild fauna; 'Stormbeahc' was recorded on location on Orford Ness in response to a chapter from 'The Wild Places', presenting a stereo-psychedelic wash of hydrophonic sound criss-crossed with FM signals and containing a truly chilling section of drone and eerie, unidentified whine that's given us the willies, we tell thee. Recommended.